Home Three Jaw Self Centering Chuck What are the tool holding devices used on drilling machine? What are the tool holding devices used on drilling machine? 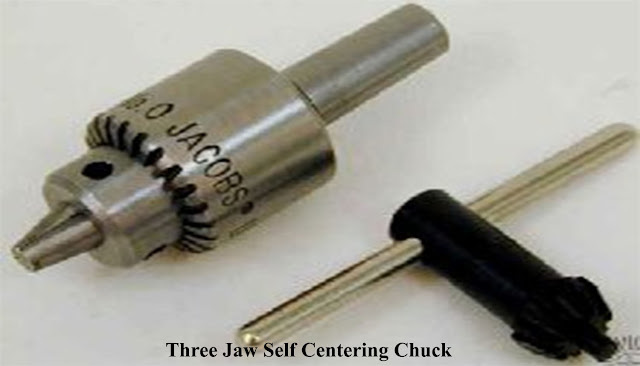 (a) Three Jaw Self Centering Chuck. This chuck is used to hold tools having straight shank. Three slots are cut 120O apart from the chuck body, which houses three jaws having thread cut at the back that meshes with a ring nut. The ring nut is attached to the sleeve. Bevel teeth are cut all around the sleeve body the sleeve may be rotated by rotating a key having bevel teeth cut on its face which meshes with the bevel teeth on the sleeve. The rotation of the sleeve causes the ring nut to rotate in a fixed position and all three faces closed or opened by the same amount from the centre holding or releasing the shank of a tool. (b) Quick Change Holder. The quick-change holder is known as magic chuck and particularly useful in production work. The chuck is used for locating a series of tools one after another without stopping the spindle. This reduces machining time. It consists of a body having taper shank, which is fitted in to the spindle. A sliding collar fitted loosely on the rotating body. The collar may be lowered and raised by without stopping the machine spindle. The sleeve has taper hole, which hold the tool shank. 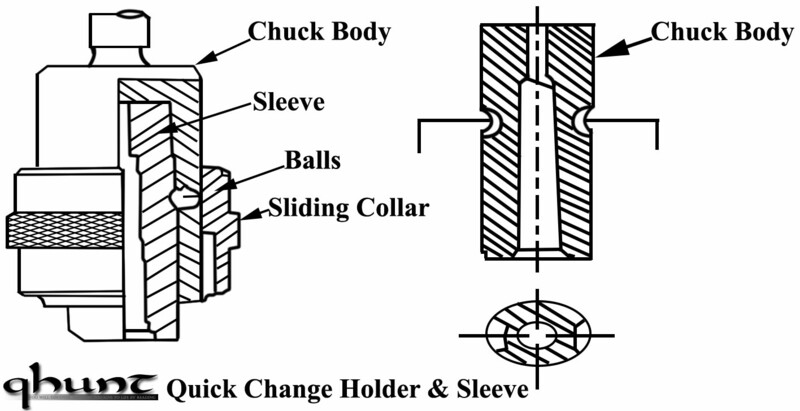 There are several sleeves used for different tools required for different machining operation. The sleeve may be fitted in to the body with the tool. Holes are provided in the body on which balls are placed and recess cut on the corresponding surface of the sleeve where the ball are placed when it is fitted in to the chuck. When the collar raised with one hand the sleeve with tool may be fitted in the chuck body with the other hand. The sleeve causes the balls to come out from the recess. When the collar is lowered it forces the ball into the recess and balls with the body of the chuck to lock the sleeve. 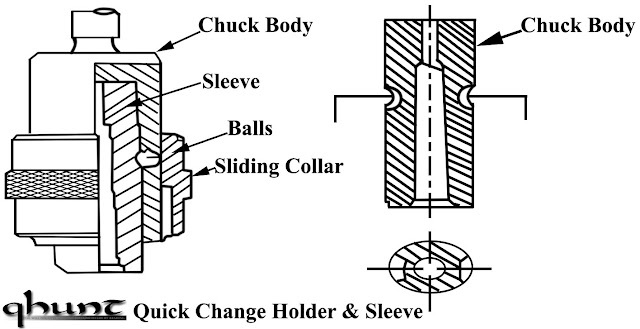 The driving motion is transmitted to the tool from the chuck body through the balls. To remove the sleeves with the tool the collar is lifted by hand and the sleeves drops out from the chuck body. (c) Sleeves. Sleeve is a holding device used in drilling operation. The sleeve is having internal and external Morse taper. The drill spindle is suitable to hold only one size of drill. When the taper shank of the tool is smaller than the taper in the spindle hole, a taper sleeve is used. The outside of the sleeve confirms to the drill spindle and the inside taper hold the shanks of smaller size tools or smaller sleeves. The sleeve has a flattened end or tang which fits into the slot of the spindle. The similar process may separate the sleeve with the tool. Different size of tool shank may be held in the spindle by using different type, sizes of sleeves. The slot in the sleeve serves the double purpose of providing a positive drive for the drill by engaging the tang of the taper shank tools or smaller sleeves and for quickly removing the drill from the machine spindle or from the bigger size sleeve.